The Daily Dimwit: Sittin' Around Saturday... going to be busy! Well, it'll be a busy day for the Dimwit! I've got a lot planned today, including getting the group break packages put together, although I think I'm out of team bags and will have to pick those up tonight at Trade Night at my local card shop. Poor planning, I know... my bad guys... all the packages will be in the mail on Monday. Today is going to be a fun day... I've got two football games to watch: Sam Houston State vs. North Dakota State University for the National Championship in FCS Division I Football! Go Bearkats! And then I've got the Texans vs. Bengals in the first ever playoff game for my Texans. I'm hoping for a double victory and an awesome Saturday! Now for today's card. I picked this up at my local card shop here in Mobile shortly after moving here a few months ago. 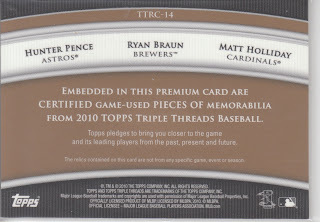 It's numbered 1/9 and is just an awesome looking card! The scan does it no justice, it's a very shiny card! 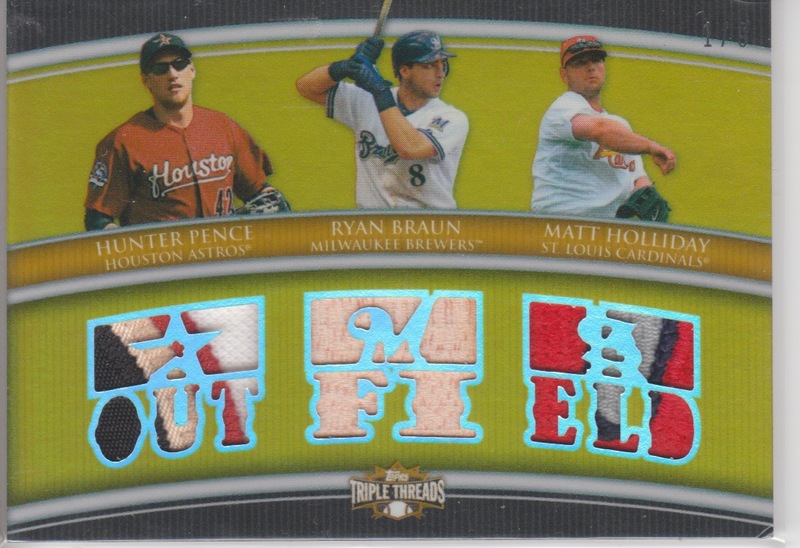 Anyways, I love the look, the cut outs for the jerseys and if it weren't for that cheater Braun... haha, just kidding... it's an awesome card. 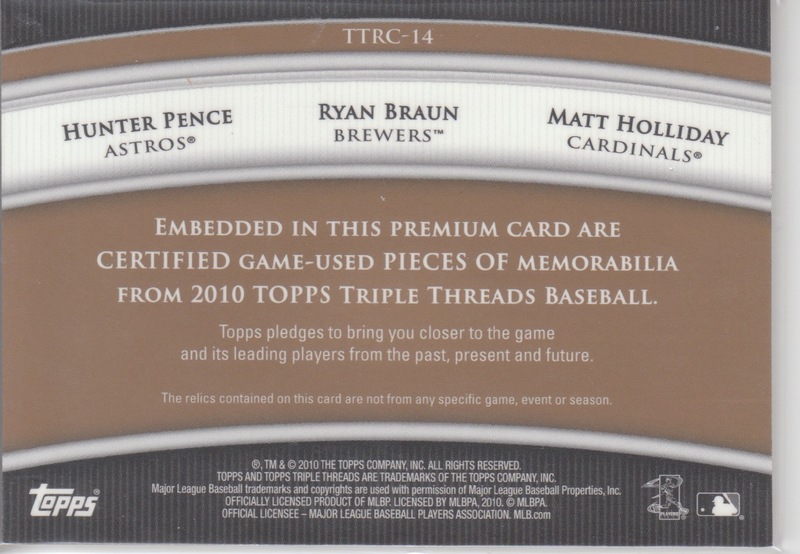 Pence will stay part of my player collection because I do really like the way he plays the game and I should be able to pick up his Astros stuff a little cheaper now as well. 1. That's a pretty ridiculous patch! 2. Great break! Although I think I and others subsidized the Marlins there, I thought it was a lot of fun and I look forward to seeing what you come up with next. Great job on the video, too. 3. Since you're sending stuff out on Monday (which is still plenty fast for a group break) can I bother you to send me that Hill auto I want and in the meantime I'll find you something good in return? Feel free to pick something on COMC or eBay if it helps, but maybe I'll hit a show at the end of the month, or you can have that Oswalt hat patch, either way. 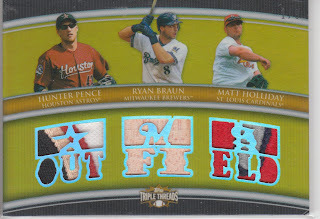 That is an awesome patch card... one of the best I've seen. Good game, Bison -- way to go, Thundering Herd!